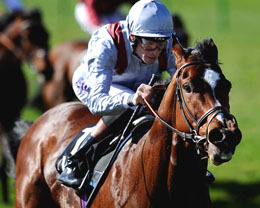 The first classic of the new flat turf season takes place at Newmarket on Saturday with the 2000 Guineas. The Racing world is still reeling from the shock news that Godolphin trainer Mahmood Al Zarooni administered illegal substances to several of the stables horses. Al Zarooni has been handed an eight-year ban from racing and those horses have been banned from racing until the Autumn. Among them was leading 1000 Guineas hope Certify but Godolphin does still have the 2,000 Guineas favourite in Dawn Approach, stabled with Jim Bolger in Ireland. The colt remained unbeaten as a juvenile and completed his season with an easy victory in the Dewhurst Stakes. Sheikh Mohammed bought a share in Dawn Approach after watching him win the Coventry Stakes at Royal Ascot and he was undoubtedly the best of the two-year-old colts in 2012. Bolger considered giving him a prep race for the Guineas but eventually decided to go straight to Newmarket. The mile should hold no fears for him as he has recently been supplemented for the Epsom Derby. The question is whether or not he retains his form at three and the same level of superiority over his rivals. His main market rival is Richard Hannon’s Toronado who has already shown himself to be in great shape with an impressive win in the Craven Stakes. That trial is not the guide to the Guineas that it used to be and he may not have beaten a great deal but he was an emphatic winner under a confidant ride from Richard Hughes. His price has tumbled in the last couple of weeks with 9-4 now the best odds on offer with Bet365. Aidan O’Brien dominated the English classics last season, being denied a clean sweep of all five when Encke held off Camelot in the St Leger at Doncaster. He runs three on Saturday with Joseph O’Brien electing to ride Cristoforo Colombo ahead of Mars and George Vancouver. Mars is the least exposed runner in the field having only made one racecourse appearance and he could be an exciting prospect this season. There has been a lot of support for Free Handicap winner Garswood, trained by Richard Fahey. The trainer admitted to having reservations about the colt’s ability to stay seven furlongs but he ran on strongly and should cope with the extra furlong here. Whether or not that form entitles him to be as short as 10-1 for a classic remains to be seen. It is difficult to make a case for any of the other runners and the front two in the market appear well ahead of the field on official ratings.